Can’t Remove Playjunkie? This page includes detailed Playjunkie Removal instructions! The Playjunkie extension promises to enhance your browsing experience. Once you install it, though, it reveals its true face. This app is a parasite. It falls under the PUP (Potentially Unwanted Program) category. Do not get confused by the category, though. You don’t want this PUP! It is an aggressive ad-generating invader. Playjunkie is a complete and utter menace. It sneaks into your OS and corrupts your web browser. It alters your settings and throws you in a whirlwind of reshuffles. The parasite replaces both your default search engine and preferable homepage. It forces its customized search on you, as well as numerous ads. The PUP injects adverts on every website you visit. Even web pages that used to be ad-free get heavy on coupons and discounts. Pop-ups and notifications appear every time you so much as touch your browser. The parasite may turn random website text into hyperlinks, as well as play video commercials. And as if that’s not bad enough, but it also dares loads questionable websites in new tabs and windows. Do you feel comfortable knowing that any web page out there may pop up on your screen? You have reason to be worried. Playjunkie has no filters nor security mechanism. This parasite gets paid to advertise, not to guarantee your well-being. It threatens to load deceptive, inappropriate, and corrupted content. Do not risk ending up in awkward, humiliating, and dangerous situations. Remove the PUP before it gets a chance you get you in trouble! How did I get infected with Playjunkie? Playjunkie has an official download. That, however, is not its main distribution channel. The PUP employs deception to slither into your system unnoticed. It uses torrents, fake updates, corrupted links, and spam messages. This parasite lurks in the shadows and waits for an opportunity to attack. It strikes when you let your guard down. Do not make its job easier. Do not give into naivety. No anti-virus app can protect you if you toss caution to the wind. Only your actions can keep your device secure and virus free. Always take the time to do your due diligence. Don’t visit suspicious websites. Download software and updates from reliable sources only. And take the time to install your apps properly. Don’t rush. Bear in mind that the majority of the free apps we download off the Web come bundled with bonus software. If you are not careful, you might install potentially dangerous bonuses. Do not allow this scenario to unfold! If available, use the advanced/custom setup option. Make sure you know what you install. Read the terms and conditions before you agree to them. If you cannot spare enough time to go through the whole document, scan it with an online EULA analyzer. Opt out of the installation if you notice anything suspicious. Playjunkie is a nightmare. Once it calls your browser “home,” corruption ensues. Your browser gets flooded with ads. Whether you type a search query or watch a video, adverts pop up out of the blue. You can barely get any work done. Notifications and alerts make every task harder. Even your videos get paused for commercial breaks. That’s the nature of the PUP. It uses every opportunity to interrupt you with an advert of some kind. The more ads you see, the bigger the chance you click on one. And when you do, the PUP gets paid. It gets even more money for every website you visit. And thus, it also loads sponsored pages in new tabs and windows. Its constant interruptions, however, are not mere annoyances. They endanger your security. 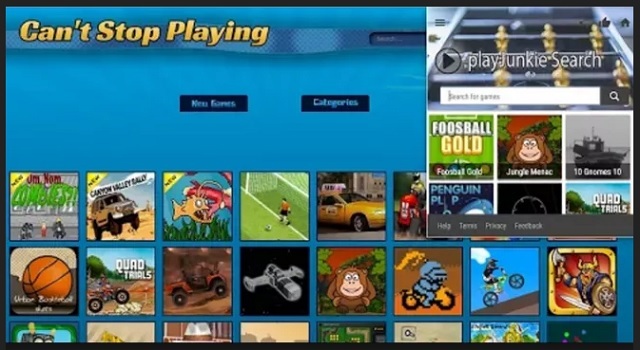 As everything displayed by Playjunkie, its ads are unreliable and potentially dangerous. Numerous crooks use the PUP to spread deceptive ads. The crooks flood your browser with irresistible offers. They show you what you want to see, but when you click, bad things happen! Do not test your luck. The sneaky PUP has no place on your system. It is intrusive, menacing, and dangerous. Do what’s best for you and your system. Remove this invader ASAP! How Can I Remove Playjunkie? If you perform exactly the steps below you should be able to remove the Playjunkie infection. Please, follow the procedures in the exact order. Please, consider to print this guide or have another computer at your disposal. You will NOT need any USB sticks or CDs. Locate the Playjunkie program and click on uninstall/change. To facilitate the search you can sort the programs by date. Review the most recent installed programs first. In general you should remove all unknown programs. Navigate to C:/Program Files and delete Playjunkie folder. Double check with any antimalware program for any leftovers. Keep your software up-to date! Playjunkie may have the ability to replicate itself, if not completely cleaned. This may require tracking down hundreds of files and registry keys. You can choose to use Spyhunter Professional Anti-Malware Program to deal with any infection that might be lurking along with Playjunkie!